Fred Sasakamoose belongs to a hockey fraternity whose most famous member is Don Cherry. It is a brotherhood of the unfortunate, of the suddenly lame, of the hard working but unspectacular. They are the cup-of-coffee gang. Jobs were scarce in the days of the six-team National Hockey League as legions of fellows eager to escape a life in the dangerous mines of Ontario or on the hard-scrabble farms of Saskatchewan clamoured to take your spot. Cherry played only a single NHL game. Sasakamoose's tenure lasted all of 11. His modest career included no goals or assists and six penalty minutes for the Chicago Blackhawks at the end of their dismal 1953-54 campaign. Yet, these days, Sasakamoose, 63, "an Indian from the bush" in his words, finds himself hailed as a hero by his people. 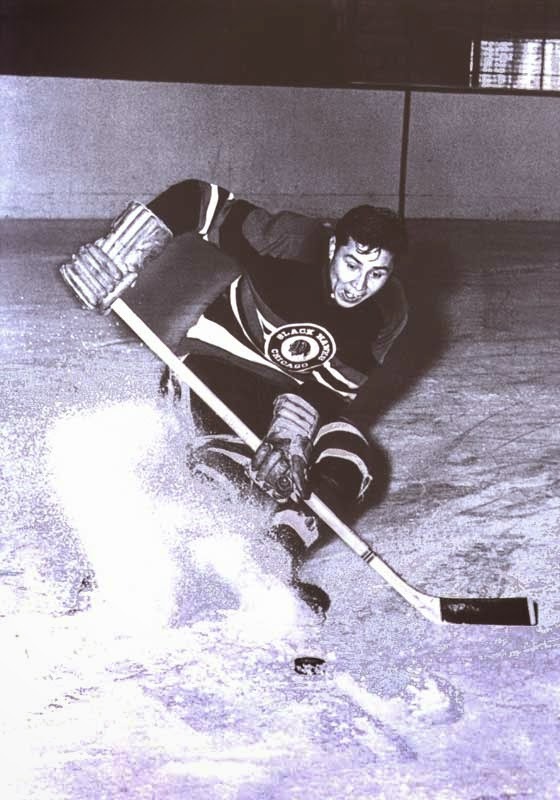 A Cree born and raised on reserves, he was the first treaty Indian to play in the NHL. While sporting victory can be short-lived and records are made to be broken, any pioneer holds an honour that cannot be taken away. With it comes a responsibility that cannot be escaped. Just the other day, Sasakamoose, who lives on the Ahtakakoop (Sandy Lake) Reserve in Saskatchewan, about 100 kilometres west of Prince Albert, received a batch of 86 letters from children at the Six Nations reserve in Ontario. Retired NHL tough guy Stan Jonathan, who was coached by Cherry while with the Boston Bruins, had urged the children to write to Sasakamoose to learn his story. "Being an Indian from the bush country, ending up with that kind of gift, maybe I was blessed in a special way," Sasakamoose said of his hockey talent. "Now I dream and I pass through it. Memories. I guess that's all it is now." Though his skills took him to the big city, Sasakamoose retains his country way of speaking, with its deliberate monotone and choppy diction. He was born on Christmas Day, 1933, in an isolated land of bush and forest, where the harshness of life is reflected in the names of scattered reserves — Grizzly Bear's Head, Lean Man, Mosquito. His earliest memories are of snaring rabbits and prairie chickens, of trapping beaver and muskrats, of fishing rivers and lakes. "We were poor. We had nothing. Lived in a log house that was 20 feet by 20 feet." As a boy, he first skated on a frozen slough on his reserve. "It got awful cold out there. That's why you learn how to skate fast." At age 8, he was taken from his parents and sent to St. Michael's residential school in Duck Lake, where he remembers the French-Canadian priests being as fanatical about discipline as they were about hockey. "They made us talk English when we first come in there. They wanted us to lose our culture. I damn near forgot my language. I couldn't talk." "We got punished, we got punished pretty hard. I got strapped. I'm not going to complain about it. I learned to behave." Mornings were taken up by classes and afternoons by care of the school's substantial farm. Early evenings were for hockey. St. Michael's owned only a few pairs of skates, and the students were certainly too poor to have their own, so older boys got to use the school's stock. Dessert was served but once a week. Every Sunday in winter, Sasakamoose would trade his dish of ice cream to an older boy for an hour's worth of skating. "Father used to stand at the middle of the ice. If you weren't paying attention to the whistle, he'd fire the puck at you." St. Michael's forged a midget powerhouse, winning the provincial championship over Regina when Sasakamoose was 15. The next season, he was asked to try out for the Moose Jaw Canucks junior team. "I didn't want to go. I [had] just got back home. Going home was beautiful. I never seen my parents. I told my mom and dad that I would go for two weeks. After two weeks, that's it, I'm coming home." "We really didn't get along with the white kids," recalls Fred's younger brother Peter, who also had a tryout. "We go to the dressing rooms and no one would talk to you because you were Indian. I got so damn lonesome I left." 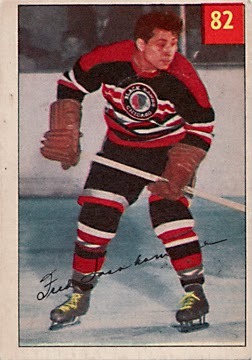 Fred stayed, earning a reputation as a slick-skating centre with a hard shot. Yet, he, too, was a stranger in a strange land. "Edmonton, Regina, Lethbridge, there was always discrimination. They called you names. That's part of life, I guess. I got used to it. "I didn't know that society well, that outside life. I knew they were the dominant race, I knew they had everything we didn't have. "I felt at that time I always walked behind everybody else. After a while, I learned to play their game, to play their game better than they did." At 16, he signed with the Chicago Blackhawks, becoming their property in exchange for $100. Meanwhile, his game improved, he was named Canucks captain, and he got new linemates in whose honour he replaced his white skate laces with a yellow one and a black one. "After three years in junior hockey, they put me with a Chinaman, Jimmy Chong, on left wing and a coloured guy from Edmonton on right wing. The fans, they laugh at you because you're an Indian. When they put the little black guy beside me, I felt a little more comfortable." In February of 1954, after a playoff loss to the Regina Pats, Sasakamoose sat soaked in the Moose Jaw dressing room, contemplating the end of his junior career and eagerly anticipating his return to the reserve. While he dressed, a team official carrying a suitcase entered the room to read a telegram. Sasakamoose, at 20, was to report immediately to the Chicago Blackhawks. The suitcase included three suits, shirts and a watch. He caught the next train out of Regina for Toronto. Arriving at Union Station on Feb. 27, he was awestruck by the height of the Royal York Hotel across the street. "Coming from the bush, I knew tall trees, sure, but this was a different thing, this white society. Huge buildings. I thought, 'Where the heck am I?' "
The first stop was at a radio station, where he was given a box of cigars and a battery-operated transistor radio for doing an interview. "They asked me to speak Cree, to talk my language. I said, [speaking his native language] 'Hello, you'll be able to see me at the hockey game tonight.' I talked to all the Indians. I don't know if there were any Cree out there, but I doubt it." He remembers the announcers greeting him by saying, "How!" as though he was from a Hollywood backlot. "I raised up my hand, just like an old Indian, and said, 'Howe. Gordie Howe.' "
His strongest memory of that night at Maple Leaf Gardens is of Foster Hewitt asking him how to pronounce his name. He later learned that all of Sandy Lake had gathered around the radio to listen to Hockey Night in Canada, his mother hovering over the set, though she spoke no English. The Blackhawks were a hapless squad, struggling through what would prove to be the franchise's worst-ever season. They finished in the cellar, with 12 wins, 51 losses and seven ties. Perhaps most indicative of the team's weakness was that they surrendered 242 goals, 60 more than any other club. And yet goalie Al Rollins (3.23 goals-against average) won the Hart Trophy as the NHL's most valuable player. The first time Sasakamoose stepped onto the ice at old Chicago Stadium, the organist played Indian Love Call. He wore the number 21, a jersey later made famous by Stan Mikita. The significance of an Indian wearing the Indian-head jersey was not lost on Sasakamoose, who was, predictably, called Chief by his new teammates. "Freddie was an energetic skater," recalled Peter Conacher, 65, whose 19 goals led the Hawks that season. "But he was like the rest of us when we were called up from junior -- nervous, unsure, not confident." Sasakamoose stood only 5-foot-9, and Conacher remembers "his sweater almost coming down to his kneecaps." On his way home at the end of the season, Sasakamoose stopped in Humboldt to buy a 1954 Dodge DeSoto for $3,900. "There were no cars on the reserve in them days, not even a road," he said. "Only a trail." He bumped along before stopping outside the log cabin in which he grew up. He remembers his mother stepping out on the small porch. She saw a shiny new car with a man in a suit behind the wheel. "Moonias , moonias ," she called into the cabin in Cree. White man. Sasakamoose stepped out of his car. "She looked at me and started crying. Nikosis . My son." He offered to take them for a drive anywhere they wished. They settled on the general store 13 kilometres away, where they loaded up on groceries and a pair of rubber boots for his dad. He returned to the Blackhawks in the fall, but was sent down to the minors just before the season started. He played for Chicoutimi of the Quebec Hockey League and for the New Westminster Royals of the Western Hockey League, ending his career with Calgary of the WHL. Along the way, he picked up titles from the natives who flocked to watch him play -- Chief Running Deer and Chief Thunderstick. "One day, my wife said, 'Either me, or your hockey.' I didn't like to lose her. You throw away your fame, you throw away your riches. What is money? I looked at it that money was not everything." Still, Sasakamoose was in demand, especially when semi-professional clubs in Saskatchewan faced a big game. Since there were no phone lines to the reserve, owners and supporters would make the long trek, outbidding one another for his services. Today, he lives not far from the slough on which he first skated, operating a water truck and farming 160 hectares of wheat and canola that has not flourished under this summer's dry sky. "I'm not rich, I'm not wealthy. I have a life and I have a job. I'm also a farmer. I live comfortably, but not in riches. I have 35 grandchildren and four great-grandchildren, so I guess I got riches." He has but one regret about his NHL days. "I always dreamed of scoring a goal. I came awful close, but close isn't good enough. If I had a goal, then I would have a puck." The tour at the provincial legislature was interrupted when some nut began shouting. He wore a cravat, a top hat, and a three-piece suit. You could tell he was a nut because who in this century wears a cravat before Victoria Day? He spoke in a loud voice and moved with theatrical flourish. "My name is Amor de Cosmos. "I truly am a lover of the universe. In three different languages!" He wasn't just any nut at the legislature. He was the province's second premier, a kook and an eccentric and a model for so many elected officials to follow. He looked pretty good for a fellow who has been dead for almost 109 years. "Do you like my name?" he asked. "I am, you see, a product of my own creation." The man then proceeded to offer his history -- born in Nova Scotia as plain Will Smith; off to California to find his fortune in the gold fields, returning richer only in name; follows gold to British Columbia, where he stays to open a newspaper; earns the displeasure of the establishment through his acerbic writings; advocates the colony join Confederation. Amor de Cosmos is not the only historical figure on hand at the provincial legislature these days. Queen Victoria can be found beneath a parasol on the granite steps, joined by the likes of Francis Rattenbury, who designed the formidable building; Sir James Douglas, the father of British Columbia and known as Old Square-Toes; Sir Matthew Baillie Begbie, the Hanging Judge; and Nellie Cashman, the Miner's Angel. The characters are portrayed by young actors known as the Parliamentary Players. Like politicians on the campaign hustings, they ask of us a willful suspension of disbelief. Unlike the amateur thespians who plead for our votes, these actors want no more than to win our attention and, perhaps, applause at the end of a monologue. So, amid the marble and gold-leaf splendour of a majestic building, the young actors sweat in their heavy wool suits to bring to life characters beyond living memory. They have signed up for a 16-week run, which began Monday after two weeks of practice and rehearsal. The actors, who are employees of the legislature, deliver spiels during the free tours offered several times daily for tourists and schoolchildren. Jennifer Ives, a 20-year-old tour guide, had just begun to describe a mural in the rotunda depicting Old Square-Toes and the Hanging Judge when Amor de Cosmos slipped in behind the group to interrupt. "Douglas-Baillie, Baillie-Douglas. How incredibly dull," he stated. The 19 members of the 10:20 a.m. tour group spun on the rotunda's floor to stare at the interloper. In a slight Maritime lilt, the man spoke of his many accomplishments, as well as his overwhelming modesty. Among his achievements was the launching of the British Colonist, a newspaper, which, after mergers with other publications, still appears on the streets here seven days a week. Whatever the merits of the current edition, the founding editor bravely challenged the colony's elite, saying: "I took great pride in being a thorn in the side of Douglas's nepotism and Baillie's tyranny. Thank heavens for me." He also took credit for leading the argument for the colony's entry into the Canadian Confederation. "But do you see any pictures of me in this esteemed rotunda? You must look far deeper into the bowels of this building to find my portrait. A wee bit smaller than these, too," he said, indicating the large murals surrounding the group. Scott Hendrickson, a 20-year-old theatre student at the University of Victoria, had never heard of Amor de Cosmos until he saw last year's production. He is excited about interpreting a dramatic character of Shakespearean proportions. "Amor de Cosmos is an awesome guy fighting for our freedoms," Mr. Hendrickson said. "It's cool we're bringing him to life again." A century from now, budding actors will have no shortage of characters to portray during tours of the legislative buildings. The Zalm provides a fantastic opportunity, as would Fat L'il Dave Barrett, an orator of great wit who gave himself the mocking nickname. Some of the supporting roles could be filled by Flyin' Phil Gaglardi, the pedal-to-the-metal highways minister who did not drive too fast so much as fly too low; or Glen (Glennochio) Clark, the pugnacious premier from eastside Vancouver who got decked by a police raid; or Gordon Wilson and Judi Tyabji, whose caucus canoodling led to their being called the Liberal Lovebirds. Over the coming months, as the novelty of portraying a historic character wears off, members of the Parliamentary Players can find encouragement from the success of one of their predecessors. Broadcaster Adam Sawatsky, one of the popular hosts at A Channel in Victoria, once spent a summer at the legislature as the architect Rattenbury. From such foundations a career can be built. TACOMA, Wash. - Space aliens work in mysterious ways. They kidnap people and tinker with their brains but they won't appear on Donahue. So when ordinary people meet to share their extraordinary tales of close encounters with extra-terrestrials, no story is too far- fetched. "On Nov. 26, 1969," says Edward Palmer, 85, a retired psychiatrist, "I was picked up by a UFO and taken to the moon. A lot of people live inside it." In a stuffy motel with a Robin Hood theme, 38 space cadets worked themselves into a state of UFOria this weekend at the New Dawn Foundation's 30th annual space-age conference. Their motto: "Keep looking up." The gathering is held in late June to mark the anniversary of pilot Kenneth Arnold's sighting of nine crescent-shaped craft near Mount Rainier in 1947. Saucer talkers came from as far as Brookfield, Mass., to speak on such topics as "The biblical prophets as UFO contactees." Delegates offered testimonials over the crooning of a nearby lounge singer and the roar of transport planes landing at McChord Air Force Base. They have heard all the explanations - satellites, weather balloons, swamp gas - and they don't believe a one. They have also heard all the insults, the most polite being that they are merely eccentric. "You've got to have a sense of humor or you'll never make it," says Lela Maxwell, a Tacoma poet. If space beings of superior intelligence do exist, they have chosen rather unremarkable humans as their emissaries. The New Dawn conferences are the brainchild of Wayne Aho, 74, known locally as Mr. UFO. Aho, who is a regular guest on radio talk shows, always asks: "Caller, what planet are you from?" After years of ridicule, Aho believes his people's time has come. "Not long ago President Bush said, 'The world is entering a new dawn,' " he told delegates. "He used the very words we have on our brochure." One of seven children born to a family of Finnish homesteaders, Aho is a retired logger and army major. He has been on a mission since the day he saw a flying saucer in the Mojave desert in 1957. As well, he hears voices not unlike those heeded by Kevin Costner in Field of Dreams. Aho bought a field near Mount Rainier for use as a flying saucer landing pad. With his icy blue eyes, suspenders and string tie, Aho has a folksy, Reagan-like patter as he delivers his tale of past lives and cosmic consciousness. He has become accustomed to the skepticism of doubting Thomases. "I'm not afraid to tell the story, even though some say, 'weird, weird, weird,' " he said. Aho's current mission is to find a college where he can teach a course he would call UFO 101. As a text, he would use the Bible, which he calls the best flying saucer book in the world. "It's got UFOs from cover to cover," he says. Despite their own faith, UFO buffs say powerful forces are suppressing the truth about space aliens. "The UFO is the biggest coverup ever, bigger even than Watergate," says Paul Dickey of Tuscon, Ariz. "Now, I can't prove this, but I believe they killed people to cover this up." Dickey, 64, insists he was hounded from his job with military intelligence in the 1960s after reporting he had seen a UFO. He believes high government officials have ordered his silence. "President Johnson said, 'Shut that guy Dickey up!' "
In the shadowy world of saucer fanciers, the CIA, the Pentagon, the White House, the National Security Council and the Federal Reserve Bank are all part of a grand conspiracy. "The key to all this," Dickey said, "is that no UFO has ever been seen refuelling at a gas station." You mean, the big oil companies run the world? Dickey looked as if he were speaking to a particularly slow- witted child. "Everybody knows that," he said.